Generating complex emulsion droplets that can be used to fabricate highly compartmentalized microconstructs is difficult to achieve with classic droplet-forming fluidic junctions. These junctions have simple geometries, which can result in a narrow range of flow rate control. To address this issue, one research group designed an oscillatory microfluidic junction with a more complicated geometry. This junction, called the bat-wing junction, can consistently produce uniform and complex double-emulsion droplets, with bespoke components and encapsulated reagents. Droplet microfluidics enables the formation of large amounts of uniform, controllable, and independent miniaturized liquid droplets. This field is particularly useful for consistently generating multiple emulsions. 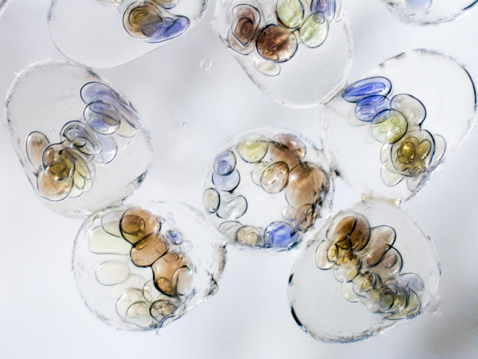 Multiple-emulsion droplets can be used to form microscale particles that have cell-like internal structures with specific arrangements, allowing for programmed chemical interactions in different biological engineering disciplines. Double-emulsion droplets. Image by Catrin Sohrabi — Own work. Licensed under CC BY-SA 4.0, via Wikimedia Commons. To avoid issues with droplet forming, engineers are looking to design junctions with better flow rate controls to help keep the droplet morphology within a specified narrow range for more precise and compartmentalized droplet formation. A research team from the Applied Microfluidic Laboratory at the School of Engineering, Cardiff University, designed a bifurcated microfluidic geometry to address these issues. Their microfluidic junction, called a bat-wing junction, makes use of a stepwise emulsification mechanism and precision flow sectioning to consistently form complex and highly uniform double-emulsion droplets. The geometry of the bat-wing junction is more complicated than that of a classic droplet-forming junction. It consists of two cross-shaped intersections that are linked via an expansion zone and aligned end to end. The intersections share side inlets with bifurcations and end in an expansion outlet. During droplet formation, the bifurcation structures of this junction oscillate the side flows. The structure of the junction impacts the droplet formation process due to the spatial constraints on the delivery and by affecting the fluid interactions. Close-up view of the bat-wing junction. Image courtesy Jin Li. The first step in this droplet-forming process is to generate the first emulsion, forming the inner droplets, also called the cores. Next, the bat-wing junction precisely sections the first emulsion to form uniform double-emulsion droplets that encapsulate the cores. 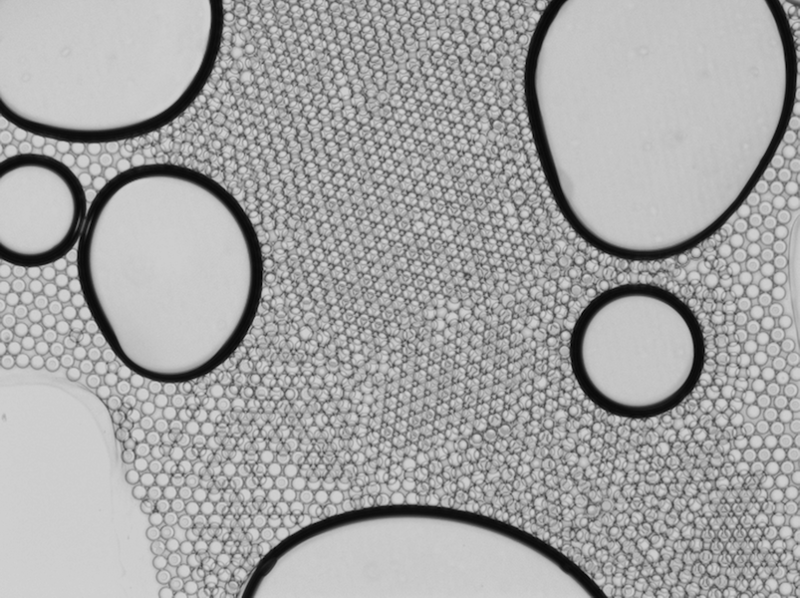 These droplets eventually take on a spherical shape, at which point the cores gain a specific 3D arrangement (depending on the specific emulsion morphology). 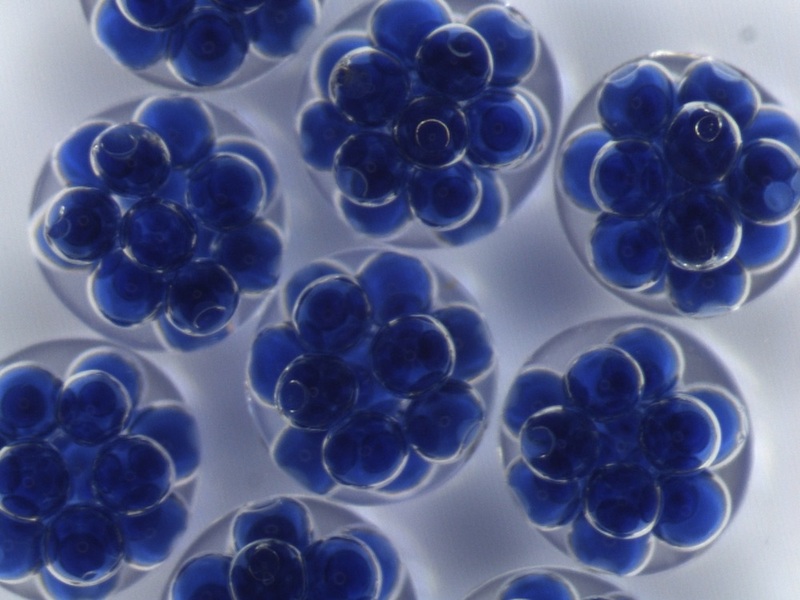 The droplets can be used as templates to generate highly compartmentalized microcapsules and multisomes. The research team used the Microfluidics Module, an add-on product to the COMSOL Multiphysics® software, to study the droplet formation process in the bat-wing junction. Using the module, they were able to visualize the droplet breakup process by plotting isosurface, volume, velocity magnitude, and pressure distributions at geometric median surfaces. Simulation also provides a glimpse into the flow oscillation phenomena at the bat-wing junction’s bifurcated side channels. The results show that the continuous phase volumes flowing from the upstream and downstream bifurcations to the expansion zone vary dramatically during droplet formation, which causes different flow patterns. The results suggest that it’s possible to control the droplet breakup point and size by adjusting the continuous phase inflow rate, precisely generating dispersed phase segments of definable lengths. The oscillating bat-wing junction in action. Animation courtesy Jin Li. The results of the first investigation show that adjusting the continuous phase inflow rate enables the bat-wing junction to precisely section off uniform droplets in various volume ratios. Further, using different inflow rate combinations allows the bat-wing junction to form highly replicable droplets. As for the compartmentalized double-emulsion droplets, the research shows that altering the continuous phase flow rates can also help to precisely tune the number of cores within the double-emulsion droplets. Droplet formation in the bat-wing junction. 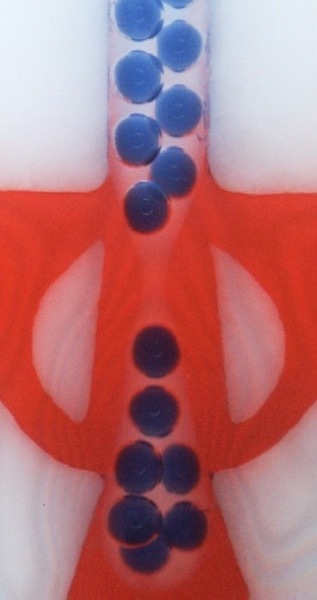 Here, multiple cores are encapsulated within double-emulsion droplets. Image courtesy Jin Li. Moving on, the team looked to learn more about droplet cores by investigating double-emulsion droplets that encapsulate different types of cores inside a single shell-phase matrix. To do so, the researchers used a system with two T-junctions to create two independent and repeating groups of droplets as a first emulsion. The pattern of these droplets was controlled by various inflow rate combinations. To form double emulsions, the first emulsions are precisely sectioned off, forming the cores that are then encapsulated. As mentioned above, the number of cores depends on the continuous phase flow rate. When the resulting double-emulsion segments become spherical, the cores rearrange themselves into a specific 3D formation. This pattern is determined by the size and amount of the cores as well as their order within the first emulsion. The experiments and simulations provided the researchers with a better understanding of the droplet formation mechanisms under different inflow rates at the bat-wing junction. The research demonstrates that bat-wing junctions can create uniform double-emulsion droplets that encapsulate different types of cores. 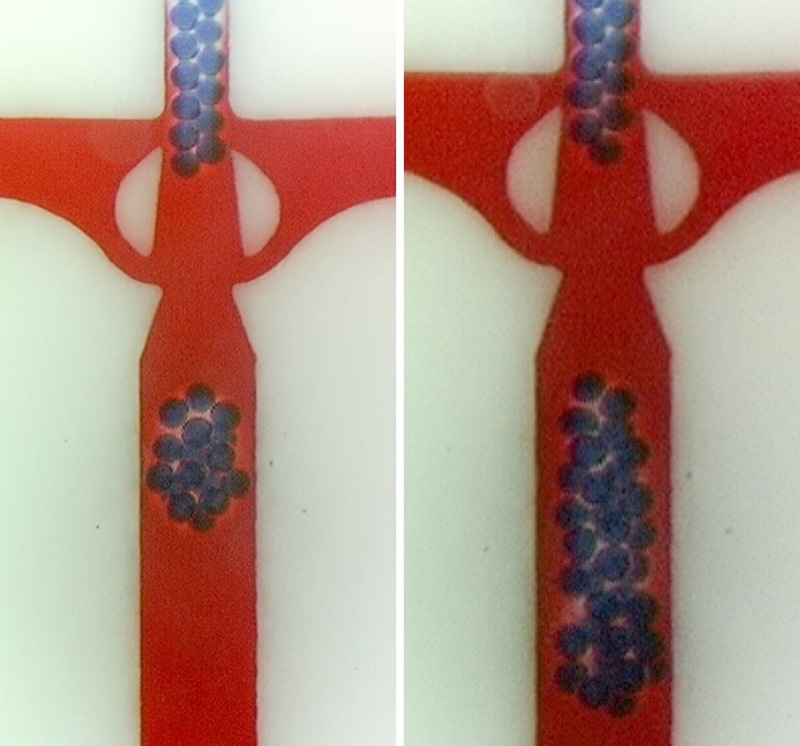 Using the double-emulsion droplets mentioned above as templates, the research team could fabricate highly compartmentalized microconstructs, such as microcapsules and multisomes, with different functionalities. For instance, the resulting multicore microcapsules could allow for multiple reagent release or in situ chemical synthesis in regard to external stimuli. Highly compartmentalized and solid microcapsules that contain multiple 3D uniform cores. The right image shows “cluster cores” and the left image shows “ring-shaped cores”. The droplets were formed from double-emulsion droplets produced by the bat-wing junction. Image courtesy Jin Li. The team analyzed the sequential chemical reactions within such highly compartmentalized constructs by monitoring the concentration changes of the chemical reagents using fluid and chemical simulations. Through this, they examined a 13-core, gas-permeable microcapsule that contains active reagents. The last reaction in the sequential chain reaction occurred in the central core due to the geometric arrangement of the cores. The same sequential chemical reactions were also simulated for a multicore multisome, with four types of cores containing different reagents. In this case, the researchers found that the bilayer positions and arrangements of the cores affect the diffusion of the regents. The reactions occurred when the molecules diffused inside the multisome. The microconstructs created via droplets from the bat-wing junction can be used for a variety of potential real-world applications in areas like biotechnology and medicine. Li and Barrow envision future uses for bat-wing junctions. Since these devices enable us to consistently and efficiently produce uniform complex emulsion droplets, the junctions “may be adopted in different applications that require the creation of cellular-like droplets; for instance, to conduct large numbers of parallel bio-/chemistry reactions simultaneously [and] to output accurate and reproducible data for the research in chemical engineering or synthetic biology.” A few specific uses include drug delivery, material fabrication, target therapy, and food generation. 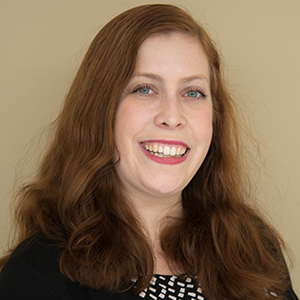 As a next step, the researchers aim to address the limitations of their research by performing further investigations into the bat-wing design.